But there's no denying that businesses seeking to capitalize on the world's second largest economy can hold tremendous promise. So we asked three top Motley Fool contributors to each find a Chinese stock they think investors should be watching closely this month. 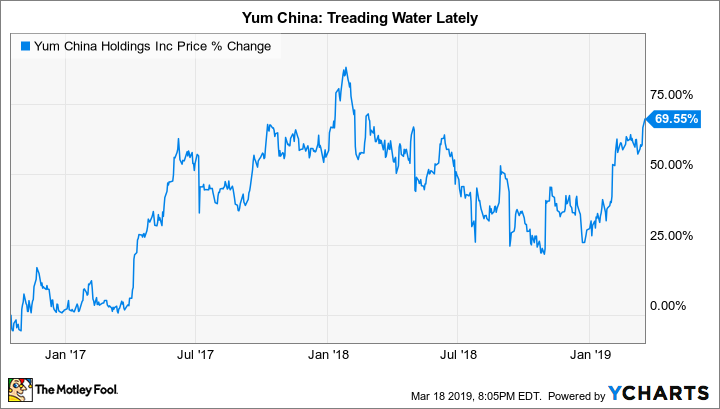 Read on to learn why they chose Tencent Holdings (NASDAQOTH:TCEHY), Yum China Holdings (NYSE:YUMC), and Bilibili (NASDAQ:BILI). Check out the latest earnings call transcripts for Yum China and other companies we cover. Leo Sun (Bilibili): Bilibili is a Chinese tech company that owns a Gen Z-oriented platform of video games, anime, and online comics. It generates most of its revenue from mobile games -- 62% of its top line last quarter -- but it's aggressively diversifying its business with live video broadcasts, online ads, and an e-commerce platform that's integrated into Alibaba's (NYSE:BABA) Taobao marketplace. Bilibili believes it will eventually generate less than half of its sales from video games. Bilibili's rapidly growing base of Gen Z users attracted big investments from Tencent (NASDAQOTH:TCEHY) and Alibaba, two aging tech giants that are facing competitive pressure from ByteDance's portfolio of popular Gen Z apps, including TikTok and Jinri Toutiao. It also impressed investors, since the stock now trades much higher than its IPO price of $11.50. Bilibili isn't profitable, and its losses are widening as it expands its ecosystem with new features, partnerships, and acquisitions such as its recent purchase of NetEase's (NASDAQ:NTES) online comics. However, the stock doesn't look that expensive at five times this year's sales, and it could rally sharply if trade tensions between the U.S. and China wane.